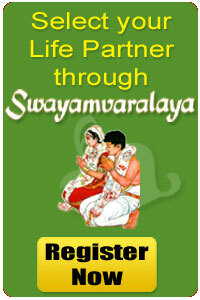 Swayamvaralya provides you the best and various payment options to avail our services at your convenience. We accept cash payment at our head office. 60/24, Govindan Road, Near Mettupalayam Bus Stop, Opp. Ezhil Hospital, West Mambalam,	Chennai- 600033. We accept Demand Draft/Cheque in favour of SWAYAMVARALAYA Payable at Chennai.